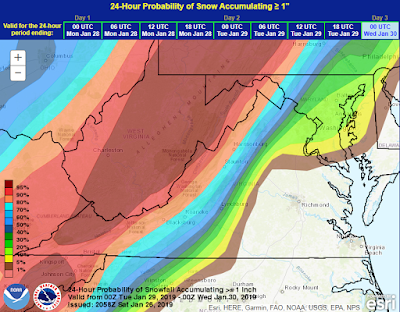 VirginiaWx is a local and regional blog dedicated to forecasting and weather ideas plus speculation in the Lynchburg/Roanoke DMA including Lynchburg, Roanoke, Danville, Blacksburg and everywhere in between. Major winter storm on tap starting tonight. Cold arctic air being attact by the subtropical jet will bring us a little bit of everything. The hope is we don't get enough freezing rain to cause major power outages. Snow overspreads the area this evening between 9 and 12pm. There may be a period of heavy snow. Southside- Snow Coating to 2 inches. Northern Amherst to Lexington to Hot Springs 3-6. Sleet will mix and change over by 4 am most areas, if not sooner. Snow totals include sleet. You may see 2 inches of snow then an inch of sleet. Mid to late morning the snow becomes freezing rain. 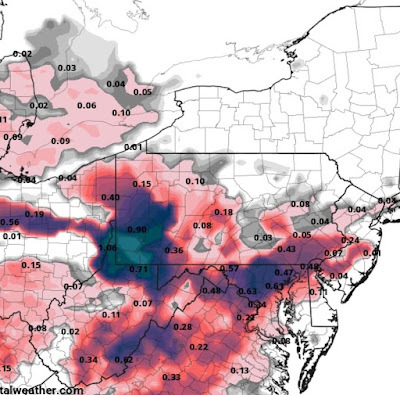 Freezing rain totals will be just at the tipping point were power outages happen. Freezing rain totals a long 460 will bet between .2 to maybe .4 with a little less down in southside. Some of the higher elevations will see up to a half inch. 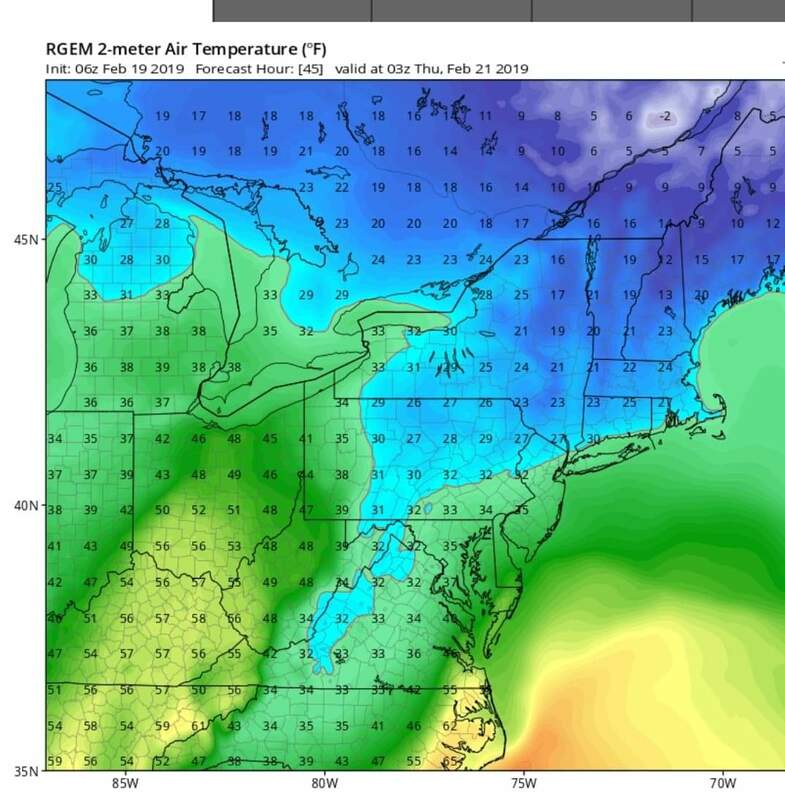 Temps will struggle to get above freezing.. Here are two models showing the 10pm Wednesday temps and the areas nestled just along and west of the blue ridge are still right at 32. Because the rain will come in waves, the lighter periods actually are more damaging because they accrue better than heavy freezing rain. Simply put, cold are is really hard to scour out in these type set ups. Would not be shocked if we went under the snow totals as at times these events like to change over sooner or would no be shocked if we saw another inch or two if the snow comes in heavier. Will update via post/tweets as the day unfolds but I would not expect and major changes. Artic air comes in Tuesday with a chance at snow.. The news/FB/Twitter has been all over the polar vortex's pending visit ( FYI, we always have a polar vortex it's just displaced south for a few days. The extreme -20 degree weather won't reach us but we may see single digits and get a day or two below freezing for high temps. We should see some snow with tumbling temps when the arctic front passes through. 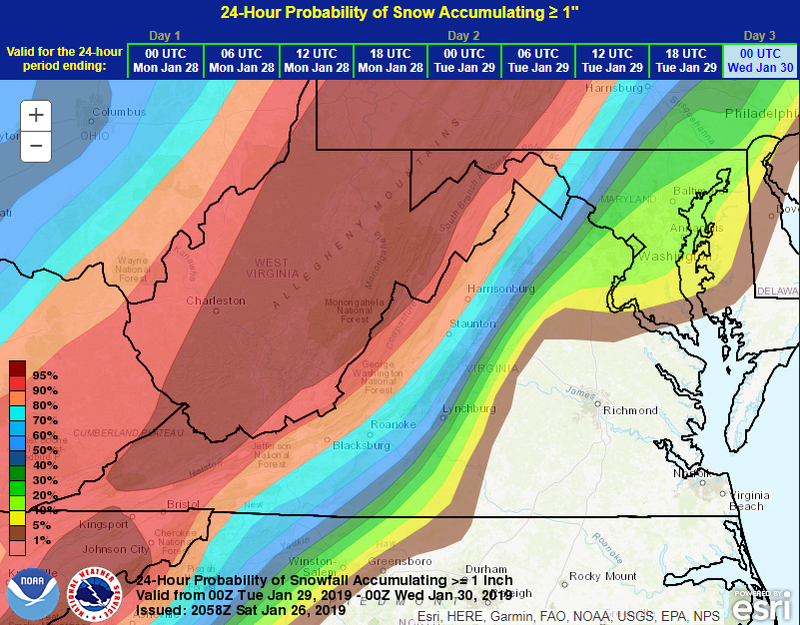 These are the current odds of seeing an inch of snow from this event.. 40-50% of an inch in the Roanoke-Lynchburg region with better odds in the mountain regions. If we get the boring outcome, temps may be in the mid 40's Tuesday, a little light rain ends as snow and the mountains see 1-3 while other places seee a coating to 2 inches. Keeping it in simple terms, the upper air energy from the polar vortex may work with another piece of energy pinwheeling around may work just perfectly to give us a shot a a little more snow. 1. It's hard to the cold to catch the moisture without a negative tilt trough axis ( the southeastern side of the energy is out in front of the northwest side, which is a negative tilt system. Hence, we could get a quarter inch of moisture and .20 falls as rain. 2. Downsloping can often be an issues-- compared to in the summer where a good line of T storms cross the mounts, die down then fire up just east of the area. So, in summary-- I think most places see rain ending as snow. School may be a no go for a lot of our region Wednesday with a dusting of snow falling at least then temps down into the low teens. *If* the system maximizes.. odds now under 25% 2 to 5 inches of powder could happen and multiple school days could be missed. Outside shot at another system in 7-8 days. We may get a brief warm up then a colder pattern may be locking in towards mid month. Look for updates on social media about the cold snap with possible snow. Tell me more about his cold and stormy pattern.. So, after the trainwreck of a forecast on Saturday-Sunday where a lot more ice fell than snow, we pulled a nice little inch at my place with snow still falling and one more decent round pushing into the area. For the season, at my house I have 16.8 - before this event ends which is about the season average. Depending on what the measure at WSET-- the official LYH number will be about the same. Roanoke is close to the seasonal average and Danville is above their seasonal average. We are in a colder pattern. My timeline stated on December 25th blog said by Jan 5, we could see something other than rain and by the 10th we may see more than a minor event. Despite the blown snow forecast, that was quite a bit of ice and snow so we did OK there. So, let's talk squad goals. In my prior blogs I talked about how the these west based low to moderate El Nino's like to have a harsh few weeks. Outside of southside, everyone doubles their seasonal total-- so the 17 or so in LYH becomes 34 for the season. Danville easily could-- but they mix a lot more than other regions due to being further south. A good comparable month could be February of 2015- we got cold but the storms were north then the dam broke. We had a 9 inch storm, 6 inch storm, 5 inch storm and 3 inch storm in about a 3 week period starting Presidents Day.. for 23 inches and the temps were 10 below normal. Now, I am not expecting a -10 for a month but for a 2 week period is possible. If we get 23 inches of snow in 3 weeks we will have a top 10 winter snowfall wise in much of our region. There are no specific threats yet.. The flash freeze-- possible that the rain ends as a little snow Sunday and we will fall in the tank cold wise. Monday would likely have been a no snow due to cold day but it is MLK day and the kids are already off. Later next week another threat could be on the horizon but the fine details are yet to be decided. In my mind, sometimes we ease into the deepest of the cold, once it is really cold threats slow down because of the severe cold and as the pattern starts to ease towards Late February another storm or two is possible. Remember to follow me on twitter and facebook for smaller updates outside the blog and if your bored, click an ad! 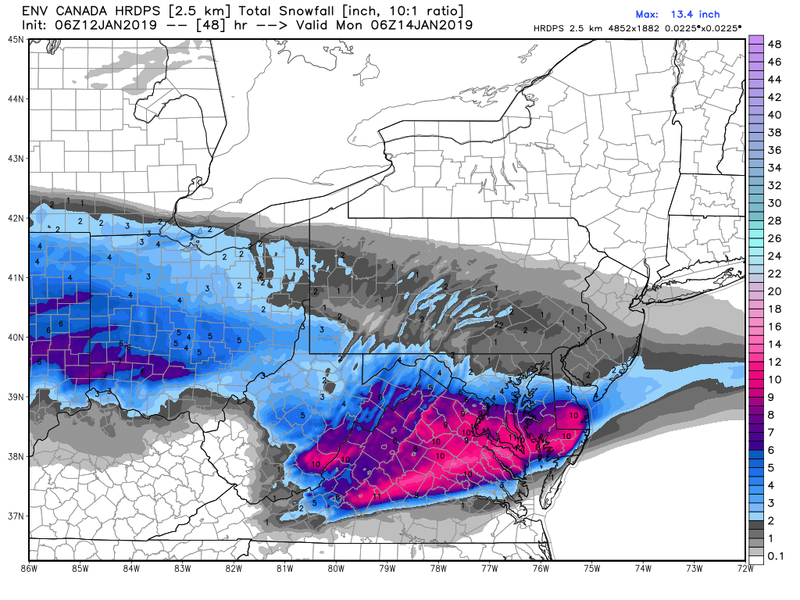 Weekend snowstorm final call..Big snow or Big Ice?? So, I have literally drawn up 2 different maps I want to use. All model data-- GFS, GGEM, EURO..etc have a decent snow along 460 with sleet getting close at some point. Just south of that, sleet mixes and then near the VA/NC border there is a raging ice storm. 4 to 8PM- most areas start as snow. Peak times that may mix along 460 will be 5 am to 10 am Sunday AM. South of that area mixing will be a problem much of the event. The heaviest stuff may be out of there by noon tomorrow but flurries and snow showers may linger well into Sunday evening. I cleaned up my map but my call will remain about the same. Along 460 that sleet line will set up. If you get sleet, it will reduce the numbers quite a bit, but for the areas that stay all snow, this will be a nice event. 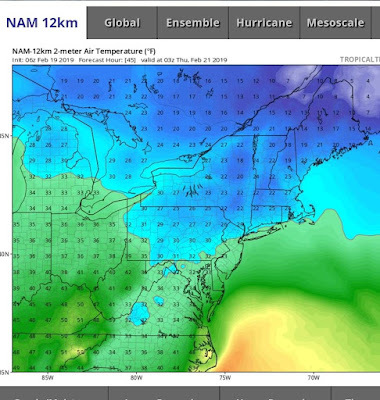 If things go ice- The NAM model is on an island making it ice well to our north. This is what falls as snow and the rest is ice. This would be a sleety, crunchy mess. If we can max out the potential-- The Canadian models which tend to do well in el nino winters think we could approach double digits, with a sharp cut off to the south that has dominant sleet and ice fall. It is not unprecidented to have such a sharp cut off from snow to ice, but it's not that common. There is usually a step down. Someone compared this event to February 1996 event where Forest and Boonesboro had 15 inches, 11 inches at the airport where there was some sleet and then down to 3 inches of sleet from Altavista to Brooknearl. Looking forward, our cold and stormy pattern is setting up. Next weekend, The Weekend of January 19th has a blip on the radar. There was an extreme event on the Euro last night where a storm arrives as cold artic air plunges in. We struggled to add depth of cold air and get 1-2 inches of freezing rain. With that, share my blog and posts to increase my readership. If you click an ad that helps too. Expect updates during the storm on my social media accounts. Weather has been my passion since I was a little boy. My father and I would be up all hours of the night tracking events such as snowstorms, hurricanes and thunderstorms. Now, I share that same passion with my friends and family.